For most of the soccer world, this summer’s Confederations Cup is the first time fans will have seen the sport’s much ballyhooed instant replay system live and in action. And as anyone familiar with replay’s fundamental epistemological shortcomings could’ve predicted, the whole process blows. The Video Assistant Referee, or VAR for short, is an additional, off-pitch ref who aids the head referee at certain critical moments. The VAR is armed with a video monitor showing different angles of the match as it happens, and during high-leverage moments—goals, red cards, penalty decisions, etc.—he watches replays of said moments and, if he thinks a call bears closer scrutiny, notifies the head referee that he’d like the match stopped to see if the refs on the pitch made the correct call. This is meant to promote obviously good and important ideals like accuracy and consistency, but in effect causes more trouble than it’s worth. Take the Confed Cup’s Cameroon-Chile match from yesterday, the first weekend of the tourney. Though not the only match in the just-started competition to be touched by VAR-related controversy, it was the one most plagued by it. This call was extremely marginal. From some angles Vargas looks just about onside, others a tick more offside than not, and in the final analysis he probably did have a shoulder past the final defender. While the VAR probably did get us to the correct call in absolute terms, in also introduced a level of uncertainty and delay that are themselves huge reasons why replay is bad. It’s not a good thing when an entire team and stadium erupt in joy right after a valid goal is scored, then the excitement dulled by the ref signaling that the play is under review, and only after the head ref makes some vague hand gestures are we certain of whether a goal was or was not scored. And it should also be mentioned that VAR was implemented to correct obviously wrong calls, not borderline cases like this. 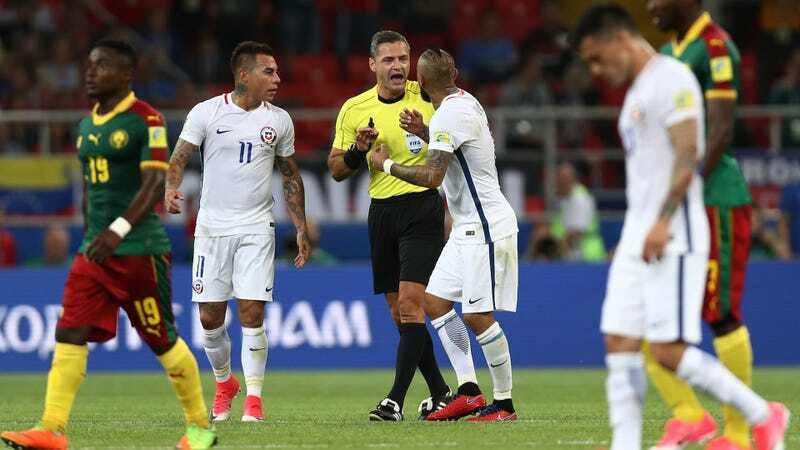 In the second big replay moment, the VAR correctly overruled the linesman who had called Vargas offside in realtime just before the Chilean slammed the would-be game-sealing goal into the net. This call was a much clearer case than the first, but it still created the same confusion and emotion-sapping delay that is endemic to this kind of replay. This instance illuminated another point of confusion with VAR, which is just how far back in a play can the video ref spot an infringement and rule out a resulting goal. While Pepe was definitely offside, there were seven seconds and three touches of the ball between when the offside Pepe played the ball and when Nani’s header went in. Again, the right call, but what if Pepe had been offside 15, 20, 30 seconds before the goal was scored? What is the cutoff point where a video referee can or should look when assessing a goal’s validity? What use is a video referee if his delayed decisions are just as unsatisfying as those the referees on the pitch make in realtime? “Those are the rules and if they benefit football, great,” said Santos in the news conference afterwards. “But no one has yet worked them out very well. Whether VAR will ultimately prove a good or bad addition to the sport is still an open question. What does seem clear right now, though, is that as currently instituted, video replay adds more doubt and confusion and annoyance than it alleviates. It’s okay if FIFA wants to continue fine tuning the replay system in friendlies like these and Mickey Mouse leagues like MLS (which is set to add VAR sometime midseason this year). But when it comes to games that actually matter, based on the evidence we’ve seen so far, VAR is not ready. Is MLB Replay Just Making Things More Complicated?